for the Eunice Kennedy Shriver National Institute of Child Health and Human Development Maternal-Fetal Medicine Units (MFMU) Network› Author Affiliations Funding The project described was supported by grants from the Eunice Kennedy Shriver National Institute of Child Health and Human Development (NICHD) [HD27915, HD36801, HD34208, HD34116, HD40485, HD40500, HD27869, HD40560, HD40544, HD53097, HD40512, HD40545] and the National Institutes of Health's National Center for Advancing Translational Sciences (NCATS) [UL1TR001070, UL1TR000439]. Comments and views of the authors do not necessarily represent views of the NICHD or the NIH. 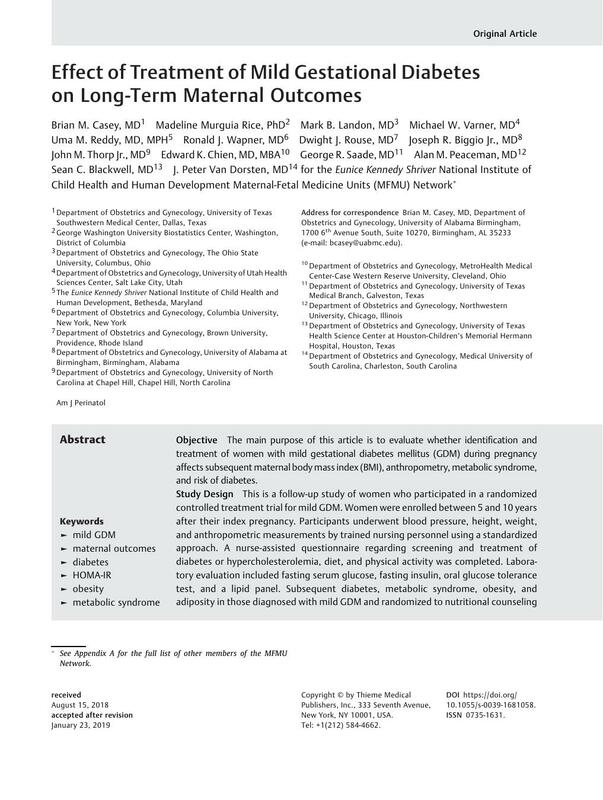 Objective The main purpose of this article is to evaluate whether identification and treatment of women with mild gestational diabetes mellitus (GDM) during pregnancy affects subsequent maternal body mass index (BMI), anthropometry, metabolic syndrome, and risk of diabetes. Study Design This is a follow-up study of women who participated in a randomized controlled treatment trial for mild GDM. Women were enrolled between 5 and 10 years after their index pregnancy. Participants underwent blood pressure, height, weight, and anthropometric measurements by trained nursing personnel using a standardized approach. A nurse-assisted questionnaire regarding screening and treatment of diabetes or hypercholesterolemia, diet, and physical activity was completed. Laboratory evaluation included fasting serum glucose, fasting insulin, oral glucose tolerance test, and a lipid panel. Subsequent diabetes, metabolic syndrome, obesity, and adiposity in those diagnosed with mild GDM and randomized to nutritional counseling and medical therapy (treated) were compared with those who underwent routine pregnancy management (untreated). Multivariable analyses were performed adjusting for race/ethnicity and years between randomization and follow-up visit. Results Four-hundred fifty-seven women with mild GDM during the index pregnancy were included in this analysis (243 treated; 214 untreated) and evaluated at a median 7 years after their index pregnancy. Baseline and follow-up characteristics were similar between treatment groups. Frequency of diabetes (9.2 vs. 8.5%, p =0.80), metabolic syndrome (32.2 vs. 34.3%, p =0.63), as well as adjusted mean values of homeostasis model assessment for insulin resistance (2.5 vs. 2.3, p =0.11) and BMI (29.4 vs. 29.1 kg/m2, p =0.67) were also not different. Conclusion Identification and treatment of women with mild GDM during pregnancy had no discernible impact on subsequent diabetes, metabolic syndrome, or obesity 7 years after delivery.